This coffee cake blew my mind away. As a newbies, it didn't occur that I could bake this mouth watering cake. However, This coffee cake was quite difficult for me. I tried three times and manage to obtain the perfect taste and texture. FYI: My hubby rated 8.5 over 10. 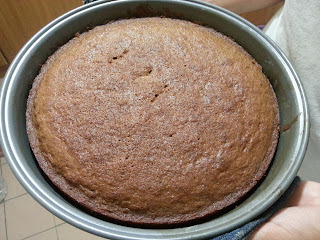 Beat the butter,coffee and icing sugar till well mix and set aside. 1. Heat the oven to 175°C . Coat baking pan with butter and dust with flour. 2. Sift flour, baking powder and baking soda into a medium bowl and set aside. 3. Beat caster sugar and butter until light in colour and fluffy. 4. Add egg , mayo, coffee powder diluted with hot water and vanilla essence together.Whisk till well mix. 5. Fold the flour mixture until incorporate. 6 .Bake until a cake tester or toothpick comes out dry. Transfer the pan to a wire rack and let cool. 7. 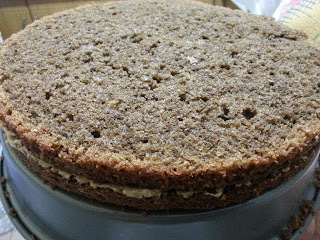 Sliced the cake into half and spread the icing on one of the layer and sandwich it. 8. Now, you can enjoy the cake.